He came, he skipped, he conquered. Again. 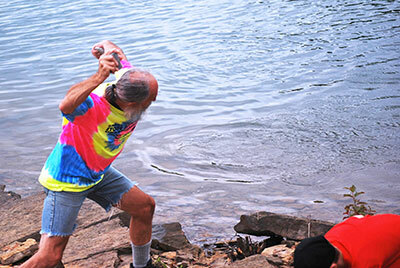 Kurt “Mountain Man” Steiner, who holds the world record for stone skipping with 88 skips, warms up before winning the Great Southern Stone Skipping Championships. Kurt Steiner of Emporium, Pennsylvania, won the third annual Great Southern Stone Skipping Championships last month at Fairfield Bay Marina on Greers Ferry Lake. His winning throw was 24 skips. Steiner, who is known as “Mountain Man” and set a world record in 2013 with 88 stone skips, won the inaugural Great Stone Skipping Championships at the Fairfield Bay Marina two years ago with 33 skips. “The wind and the chop, it will eat you right up,” said the 53-year-old Steiner about the difficult conditions the stone skippers faced during the Labor Day weekend event, which drew 44 competitors. The Saturday morning started out calm and overcast, with a temperature in the mid-70s. Within an hour the wind picked up, causing the water to ripple and become choppy. “I saw a lot of really good flat-water throws today, but they got eaten up by this water,” he said. Steiner, who has participated in a number of stone skipping competitions over the years, and won several, recently returned from one in Wales where the skipping competition was for distance, not the number of skips. He said he skipped his stone 273 feet. The winner, however, skipped his nearly 400 feet. Steiner set the world record for stone skipping — certified by the Guinness Book of World Records — on Sept. 6, 2013, at Red Bridge in the Allegheny National Forest, Pennsylvania. Steiner’s record throw has been viewed more than 700,000 times on YouTube. Steiner shows some of the stones he brought from Lake Erie to use and to let other competitors use in the Great Southern Stone Skipping Championships. The thin, pony-tailed, man, balding with some gray in his hair, said he prefers using stones gathered from the banks of Lake Erie, which is not far from his home. 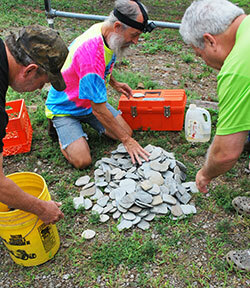 Along with a toolbox full of rocks for himself, he brought to the competition a bucket of stones and dumped them on the ground near the registration desk for other participants to use if they wished. The Lake Erie stones, flat and white, are shale and skip better, he said, adding that he brought about 30 pounds of Lake Erie rocks with him to Wales when he competed there. 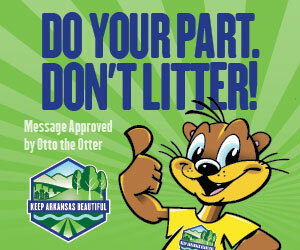 The more than $4,200 raised during the stone-skipping event went to the Arkansas Foodbank, and it is to be divided equally among its member food pantries in Choctaw, Clinton and Greers Ferry. All three pantries are in Van Buren County. For winning the stone skipping championship, Steiner received $150. 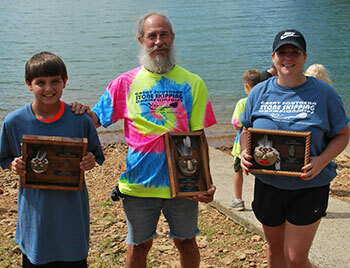 Winners of the Great Southern Stone Skipping Championships at Fairfield Bay Marina Labor Day weekend were, from left, Kaleb Park of Little Rock, youth division; Kurt “Mountain Man” Steiner of Emporium, Pennsylvania, adult men’s division; and Kreglyn Hyatt of Conway, adult women’s division. Todd Dahlin of Mountain Home took second place and won $75. Dahlin, who came in third in 2016, opted to give his prize to the foodbank. Travis Grissom of Jonesboro took third place and won $50. In the women’s flight, Kreglyn Hyatt of Conway came in first with 12 skips and won $150. Her sister-in-law, Brittney Hyatt of Maumelle, came in second and won $75. Angie Wallace of Dallas took third and won $50. In the youth division, Kaleb Parker of Little Rock was first with 11 skips and won $75. Lane Hyatt of Maumelle came in second and won $50, and Lane Jones of Morrilton took third and won $25. Tommy Hyatt of Maumelle, who did not compete this year but took second last year, was especially happy after the competition because his daughter and daughter-in-law took first and second in the women’s division, and his grandson took second in the youth division. “I just told them to go out and have fun,” Hyatt said when asked what advice he gave. John Baker of Clinton, who came up with the idea for a stone skipping competition after skipping stones with his children on a float trip and wondering if there was a world record, described the event as a success. 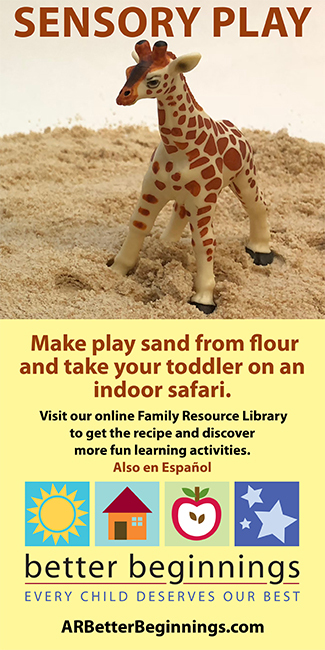 “It was a great, family-friendly event and wonderful way to say goodbye to summer at the lake,” Baker said. Rob Moritz is a Little Rock-based freelance writer.